Part of the pleasure of visiting Samothraki is trying and also taking with you the local traditional products. Samothracian Goat: this can mainly be found in Prophitis Elias and at the many taverns and restaurants in Chora, Therma and in Kamariotissa – a speciality of “Klimataria” since 1980. Open Sea Fish: found at restaurants and fish taverns in Kamariotissa, Lakomma, and Therma. Mizithra, Kaskavali and hard cheeses: Types of cheese which are made by local shepherds with local sheep’s milk. “Prausti” and other “Spoon sweets”: Prausti is a local kind of small yellow plum and this along with other fruits are traditionally made into “spoon sweets”, so called because they are usually served with a teaspoon. These can mainly be found at the cafes of the island, at shops with traditional products in Chora and the women’s cooperative “Axiokersa” in Kamariotissa. Honey: Local honey can mainly be bought from beekeepers. The Atzanos family has been producing its own flower honey for 40 years. 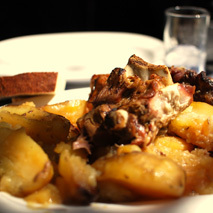 Wine and “Tsipouro”: Organic local wine and tsipouro (a strong spirit) can be found at selected establishments such as the restaurant “Klimataria”. Also at the cafe-bar “Saoki” in Therma. The Atzanos family has been producing organic wine and tsipouro for three generations.